First I would like to say everything I ever needed to know about decorating I learned from Laverne & Shirley. Growing up I don’t recall us having any furniture that matched, I’m sure our bedrooms may have started out as a matching set but by the time my parents had divorced and we moved into the little pink house on Fir all of our stuff seemed just sort of thrown together. Spending most of my teen years in a room that was sea foam green while being moody and into the Smiths was a bit of a challenge and I adopted a “cover the walls” mentality when it came to decorating. Every inch of that oh so 80’s pastel was covered with a poster, knick knack nailed to the wall or a record. I brought this style to the dorms and my apartments, no one seems to have minded but I have had to adapt as I’ve grown older. The posters tacked up to the wall have been replaced with framed ones or bits of memorabilia that has been placed into shadowboxes, definitely keeping it mainly about the music. I have kept one bit of my cover the walls and surfaces though – I tend to do this on any spare flat surface in the place. I have lots of little toys and things that have somehow managed to make it through nearly 30 years without being broken or lost. I don’t feel like I can just throw them out, not a hoarder (my fridge still works and I’ve never found a flat cat!) but I like having these little bits around. 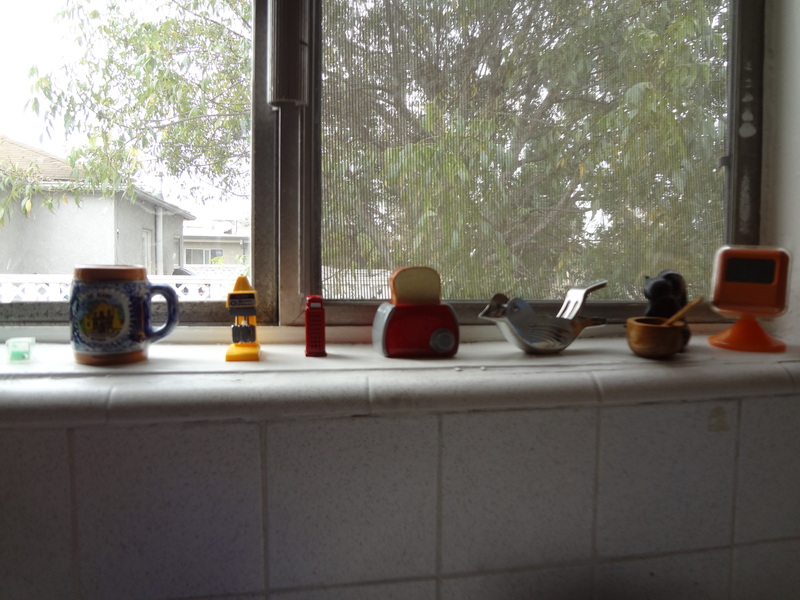 This picture is of my kitchen windowsill that little yellow thing is a wind up toy that I must have picked up when I was about 10. They’re just happy little reminders of childhood and who doesn’t love a bit of vintage thrown around the house. On my bookcase I have 70’s era Fisher Price toy and a bit of cheap mid-century furniture is littered about my front room. It all makes for a very strange mix but it works. I’m hoping the friends that have been here have been slightly inspired to be a bit more bold in their decorating. Well at the very least know that you can have lots of color and nothing has to match if you don’t want it to.